Having gained a reputation by professional users as the toughest and fastest cutting saws in the world, one of Silky’s specialties is the most thorough line of fixed and extending polesaws ever available. Lightweight yet rigid, these tools are tipped with the most sought after steel blades in the forestry business. There’s simply no substitute for specially formulated Japanese steel ground to absolute cutting perfection. For all day to day pruning and trimming tasks a pole saw is a necessity and should be part of every arborists tool kit. 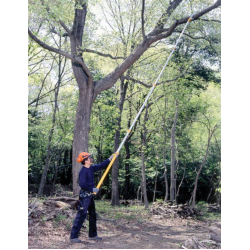 With a telescopic pole saw you can quickly prune trees without ladders or the need for climbing. Their oval design makes the pole strong and rigid even when fully extended. With lightweight aluminium construction they won’t rust and with razor sharp Zubat teeth Silky Saws make light work out of hard to reach branches.